Of all the U.S. coins, the Washington Quarter has been, in all its incarnations, perhaps the most distributed coin in history. 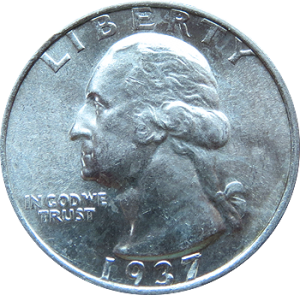 First minted in 1932, the Washington Quarter remained essentially unchanged until 1965 when the metal content was changed. From 1965 until 1998, with the exception of the Bi-centennial reverse coins minted in 1975-1976, the overall design still remained the same. From 1999 until 2008, the Mint produced the 50 states quarters with an updated obverse and reverses featuring each state. Every state was featured as well as the District of Columbia and the U.S. Territories with mint runs for each. From 2010 until current, Washington Quarters have the same obverse as the 1999+ quarters but have new reverses featuring some feature of the U.S. These are known as the “America The Beautiful” series which will consist of 56 quarters and will run through 2021. The overall specifications for the Washington Quarter have changed little over the years. They are all 24.3 millimeters in diameter which hasn’t changed since their introduction in 1932. From 1932 through 1964, the metal composition was the government regulated 90% silver/10% copper and weighed 6.3 grams. From 1965 to current, the “clad” metal content of 75% copper/25% nickel and a 100% copper core has been used. This changed the weight to 5.7 grams.